I’ve often been intrigued by Safari’s SnapBack feature – how exactly does it work, and is it useful? The basic idea of SnapBack is to save you having to click the Back button so much. You click the SnapBack icon, and Safari takes you back to the first page you visited in the current window or tab, or back to the last page of search results. Here’s how it works. The URL you last typed into your address bar. The first page you visited in a new tab or window. This week I have mostly been playing with Awaken ($13), a nifty little app that effectively turns your Mac into a glorified iTunes-driven alarm clock. Awaken’s core function is to start playing an iTunes playlist at a set alarm time, so you can wake up to your favourite music. Now this is hardly revolutionary; there are many free apps that do exactly the same thing, or you could no doubt write your own AppleScript-driven cron job to do it for you. 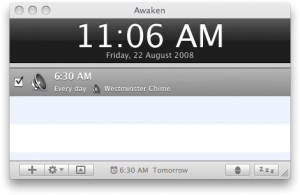 However, Awaken does offer some nice features that make it stand out from the crowd. I was messing about with Safari the other day and discovered this little gem. If you right-click (or Control-click) the page title in the title bar while viewing a web page, you get a pop-up list showing you each folder in the current URL, from the current folder all the way up to the top level of the website (or hard drive if you’re viewing a local file). You can then just click a folder in the list to jump straight to it. This is great if you’ve stumbled across an interesting page with no (or confusing) navigation, and want to jump to the site or section homepage to browse more of the website. Nice touch Apple! I’m always on the lookout for a faster, more efficient way to sort through the hundreds of photos I seem to take each month. I don’t care for iPhoto’s way of organizing images, so most of the time I use Adobe Bridge (since it came with my copy of Photoshop). I really like sifting through photos with Bridge. It’s reasonably fast, and it supports stacks, batch renaming, in-place rotation, and detailed metadata viewing. However, Bridge isn’t perfect, so when other digital asset management (DAM) apps drift into view I tend to give them a shot. Photon ($69) is the latest such app to appear on my radar. 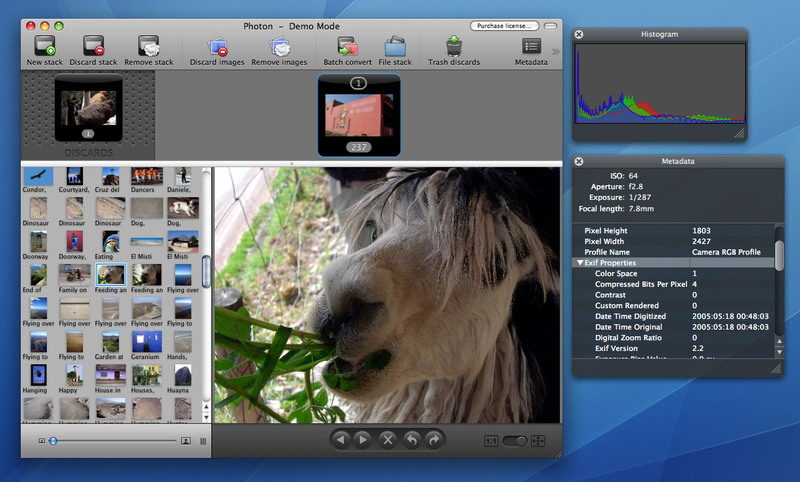 While nowhere near as comprehensive as iPhoto or Bridge, it sports a slick interface, and is ridiculously easy to use. Drag a folder of photos into the area at the top of the window – or plug in a memory card – and Photon instantly imports all the photos into a new stack. And I mean “instantly” – this thing is blazing fast, and before you know it you’re happily browsing all your photos at full resolution. Menus unforgiving of mouse slip-ups. A menu disappears if you accidentally click the separator bar between two menu options. Grrr. Dialogs hard to use with the keyboard. Not being able to type a shortcut key for all of the buttons in a dialog (a la Windows). Terrible keyboard control in general (try using iCal with just the keyboard). Horrid mouse acceleration. First thing I did with my new Mac was whack the tracking speed up to the max, and even then it’s not as nice as in Windows. And no way to control the acceleration either. Nasty keyboard navigation of text documents. Having to use the fiddly Command-Left and Command-Right keyboard shortcuts to do the extremely common tasks of going to the beginning and the end of a line. Yet the easy-to-press Home and End keys jump you to the start or end of the document without moving the caret, which is next to useless in my book. And I don’t think this is a “coming from Windows/Linux” thing either, as I switched to the Mac 2 years ago and this behaviour still pisses me off. Windows and Linux have simply done it better. Hamstrung open/save dialogs. Why can’t I do even basic things like rename a file or folder? No cut-and-paste in the Finder. You can only copy and paste stuff. Uggg. Non-intuitive Print dialog. How do I print multiple copies? Oh, I have to click a little arrow to the right of the currently-selected printer – which you’d have thought would change printers, but no, it brings up the hidden print options. And talking of the Print dialog, why can’t you move focus to the “PDF” drop-down menu with the Tab key? Shift-clicking to select a range of files in the Finder doesn’t work in Icons view. You have to switch to one of the other views to do this. I recently came across LazyMouse, a little Preference Pane app that snaps the mouse pointer to the default button in dialogs when they appear. The idea here is that you’re most likely to click the default button, so why not have the mouse cursor move there automatically and save the wrist-ache? To be honest, I’m surprised this isn’t a standard option on the Mac; I seem to remember this being an option in Windows since way back in the mid-nineties. To add insult to injury (sorry – bad pun), you have to pay $10 for this app. And you can usually just hit the Return key to activate the default button (or Esc to back out of a dialog) anyway. That said, for what it does, LazyMouse is nicely done. You can choose to snap the mouse cursor to the default button (such as Open) or the alternate button (such as Cancel). You can also have the cursor snap back to where it was before the dialog appeared – a very useful feature (though unfortunately it doesn’t work if you move the mouse at all when the dialog is open). LazyMouse also comes with a nice, easy-to-read manual. If you do a lot of mouse-work and have problems with RSI or other hand/wrist injuries then LazyMouse is certainly worth a look. It’s shareware too, so you can try it out before you buy. 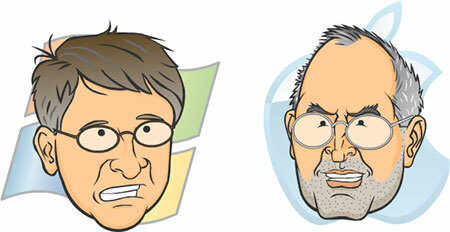 Gates vs. Jobs – the game! I’ve been having fun with this Bill Gates vs. Steve Jobs game recently. Totally daft obviously, but quite well done, especially Steve Jobs’ maniacal, slightly Ren-esque voice. I found the controls a bit tough to start with – the trick is to swipe the mouse from left to right to make an attack – but it’s a pretty easy game. Posted in Cult of Mac | Comments Off on Gates vs. Jobs – the game! Well I’m glad I took out the three-year AppleCare Protection Plan. Over the last few days my iMac’s hard disk started making ominous clicking sounds when powering on, resulting in a flashing folder with a “?” icon appearing on boot (which can never be a good thing). Once it warmed up a bit, the drive would kick in OK, but from a cold start it was a no-go. As the problems were mounting up – see my green pixel issue – I decided yesterday that it was time to call Apple tech support. On the whole, the phone call went about as smoothly as I expected. The Apple support staff do sometimes seem robot-like in their troubleshooting approach, and they treat you like it’s the first time you’ve seen a computer, but they were friendly enough. After a bit of to-ing and fro-ing, they eventually arranged for a local Apple service centre to send someone out to look at both the hard drive and green pixel problems. On-site service – fantastic! Over the last couple of days I’ve been having a play with Plex, a media centre app for the Mac that does much the same job as Apple’s built-in Front Row. You can watch DVDs, movies on your hard drive, and movie trailers from Apple’s site; listen to music; and browse photos. However, Plex takes things further than Front Row, letting you watch YouTube videos, view weather forecasts, and even play a game of Tetris. And you can do all of these things with your Apple Remote, from the comfort of your armchair. 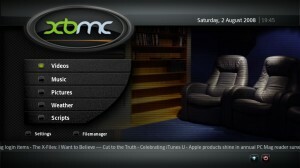 Plex is based on XBMC , an open-source media centre originally built for the Xbox. 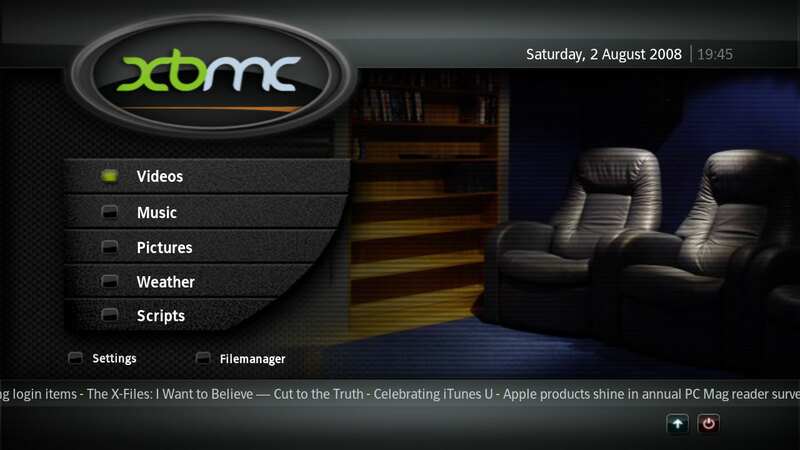 XBMC has been ported to many platforms; Plex is the new name for the Mac version. It supports a wider range of codecs than Front Row (although the free Perian QuickTime component makes Front Row much more capable on the codec front). You are currently browsing the Reality Distortion: Macs, Mac OS X, and Apple stuff weblog archives for August, 2008.